As much as I admire ruffles and lettuce-edged hems, I know they don’t suit me. Similarly, the thin-boned elegance of some aldehydic florals such as Chanel No. 5 doesn’t sit right on me, either. Yet, I’m a sucker for a fragrance with a retro feel, and richly aldehydic florals scream 1950s silhouettes and kidskin gloves. At last I discovered that not all aldehydic florals are No. 5 clones. Instead, some are warm and boast plenty of flesh. Robert Piguet Baghari is one of those. 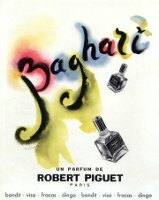 Baghari, developed in 1950 by perfumer Francis Fabron (also the nose behind Givenchy L’Interdit and Nina Ricci L’Air du Temps), had been long discontinued when the Robert Piguet perfume house hired Aurélien Guichard to reorchestrate it in 2006. Piguet lists Baghari’s notes as rose, jasmine, iris, fresh citrus, powdery amber and natural vanilla. Piguet calls Baghari a soft oriental, and Perfumes: The Guide calls Baghari an orange chypre. To me, Baghari is a spicy-citrus aldehydic floral. Baghari smells as if the perfumer were dreaming of No. 5 seen through Rita Hayworth’s sunglasses. Baghari has all the throwback glamour of a Champagne coupe full of fizzy aldehydes, but its heart is loaded with musty flowers and dried orange zest, dusted with fine-milled powder. Baghari sweetens and its sparkle diminishes as it dries down, but it remains powdery. Its amber-vanilla-powder is going to remind some people a little too much of baby care products, but to me it evokes a vintage vanity more than a diaper changing table. After a few hours, Baghari leaves a flesh-like fragrance that reminds me of No. 5’s dry vermouth and sandalwood dry down. Finally, incense appears just as Baghari fades to skin. Baghari lasts a good six hours on me and has moderate sillage. In a few words, Baghari captures the elegance of old aldehydic florals but adds warmth and a few curves, making it much easier for someone like me to wear. Other round, earthy aldehydic florals include Guerlain Vega, Sonoma Scent Studio Nostalgie and Tableau de Parfums Miriam. What would you add to the list? Robert Piguet Baghari comes in 50 ml Eau de Parfum ($95), 100 ml Eau de Parfum ($135), 30 ml Extrait de Parfum ($235), and in body products. For information on where to buy it, see Robert Piguet under Perfume Houses. Also, Baghari has made it to the online discounters. Could not agree more with your review. Baghari does indeed have a depth and warmth uncharacteristic of most aldehydic perfumes. Perfume in the grand French manner is just so satisfying and always worth wearing. I really do like this one–it’s the type of aldehydic floral that works best on me and probably on a lot of people. Marvelous review Angela! I love Baghari- need to pull it out an wear it- perfect for our spring weather in south Texas. I think it is a bonny orange cream chypre- and hope it is selling well enough for them to keep it in the fray! I hope it’s doing well, too! It would be sad to see it discontinued. Weil Zibeline was the first earthy aldehydic I though of, but then K de Krizia, Amouage gold pour Femme, Ferre for women, and Climat came to mind. I wondered about Clinique Wrappings, but it has been so long since I smelled that that I could be way off. I’m not sure I’ve ever smelled Wrappings, but it get raves, and I suppose I should try it sometime. I especially like your suggestion of Zibeline! Although it’s not as floral, I found Tauer’s Orange Star to be pretty much orangey aldehydes. Like orange soda pop! And quite warm as it dries down. Thanks for the suggestion! I do love orange fragrances. Good suggestion. One of my all-time faves. I don’t think of it as an aldehydic, exactly, but they’re there. I loooove Baghari! I totally agree that it belongs with Vega, Miriam, and Nostalgie – all dear loves of mine as well. I’m a fan of aldehydes, and will take them in almost any form: Chanel No.5, White Linen, and Lieu Au Reves. I love just reading the names of the fragrances you list! It’s like I’m smelling them all, quickly, in a row. Nice! I always associate Piguet with Bandit and Fracas and tend to be vaguely surprised when I hear that it does nice, comfortable, easy to wear fragrances. But of course it does; it has to make money, like everyone else. Any idea what the term ‘Baghari’ signifies? Nostalgie is a favourite of mine and as we are coming into autumn now, I’m looking forward to wearing it again. Baghari is nothing like either Bandit or Fracas! It has definite personality, but it wouldn’t get thrown out of a bar (as I can imagine either of the other two doing). I don’t know where the name comes from. Perhaps someone else here does. Great review! Now I am curious! Made me think that one weekend one of our topics could be thinking up a neologism for being interested or curious about a perfume — a la “olfacurious”–but I bet others would have much better ideas than that! I don’t know, olfacurious is a pretty excellent word…. I can’t say that warm floral aldehyde is a category that I’ve given much thought–perhaps because aldehydes often don’t quite work for me, either. But I LOVE Nostalgie, so this conversation will certainly add a few to the sniff list! They do have the Piguet scents–not just Baghari, but a bunch of them I haven’t tried yet (it’s impossible to keep up!). Now I want to try Baghari and all the other scents mentioned here! I know you’re a No. 5 fan, so you just might love it! Thanks, Angela! And naturally I want to try this too as it sounds rather good. When I started wearing Chanel No 5 in the late 60s (I was really, really young of course! ), I liked it because it had a richness underneath the fizzy aldehydes; it was almost sweet and had a depth to it. The modern formulation isn’t even just a pale imitation, in my opinion – it is almost a completely different perfume and I no longer wear it. I suspect that it might be that people who can’t understand the popularity of No 5 would be pleasantly surprised if they could smell the older version. The nearest I can get to something like the old stuff is L’Interdit in the Mythiques range, but I think that it has been discontinued. Maybe Baghari might fill that hole. It’s certainly worth a try. Baghari is definitely fleshier and warmer than No. 5 these days. You make this one sound very good. The only two Piguets that I am familiar with are Fracas and Bandit. I tend to like aldehydic florals so I should definitely at least try Baghari. Yes, do try it if you find yourself near a tester someday. If you like the style of an aldehydic floral, you may well like this one, too.